Gong hei fat choy! Happy Chinese New Year! It’s the Year of the Earth Pig which in Chinese astrology symbolizes a year of good fortune—especially in terms of friendship and financial rewards! Well, that’s worth celebrating and a traditional Chinese New Year celebration wouldn’t be complete without almond cookies. Almond Cookies also symbolize good luck in China. In a Cantonese restaurant you would very likely be given one instead of a fortune cookie at the end of the evening meal. (Fortune cookies aren’t eaten in China, by the way. That’s an American thing.) In China they symbolize coins and are meant to bring you good fortune and prosperity as you go on your way. 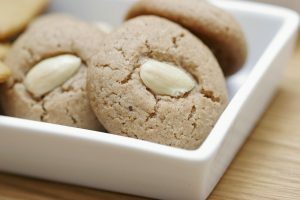 The almond cookie is a variation on the Chinese national cookie which is made with walnuts. It was originally made in the Ming Dynasty in the 16th century for the emperor and was only eaten by royalty. Later, when the recipe was released to all to enjoy, variations made with different nuts and seeds emerged. The almond variety developed its own meaning, following the symbolism of the almond nut itself. Almond trees are the first to bloom, usually in February, so they are harbingers of Spring. Chinese New Year is also known as the Spring Festival. Early, I know, but with the almond trees starting to blossom, could Spring be far away? It’s like a message from the earth that no matter how dark and cold and gloomy it’s been, good times are on their way! So it’s time to make almond cookies! And to enjoy eating them—they’re delicious. Note: you can make this recipe gluten free by substituting almond flour for the white flour recommended. It’s super easy to make yourself if you don’t have any always on hand. Add an extra egg if you do to help them hold together. It will change the texture of these cookies but tastes really good! 2. Whisk egg in a bowl, remove 1 tablespoon and put in a small dish to use later. 4. Add in almond extract and the whisked egg. Beat until well combined. 5. Combine flour, baking soda, and salt in a separate bowl. Then slowly add to the wet mixture. 6. Make 1-inch balls of the dough and place them on an ungreased baking sheet, about two inches apart. 7. Flatten the balls with a fork or the bottom of a glass until about ¼-inch thick. 8. Place a whole almond in the middle of each one and press down gently. 10. Bake 15 minutes, or until edges and bottoms are lightly browned. 11. Wait a couple of minutes before removing from the pan. Then place on a rack to completely cool. Serve with tea or a glass of wine.